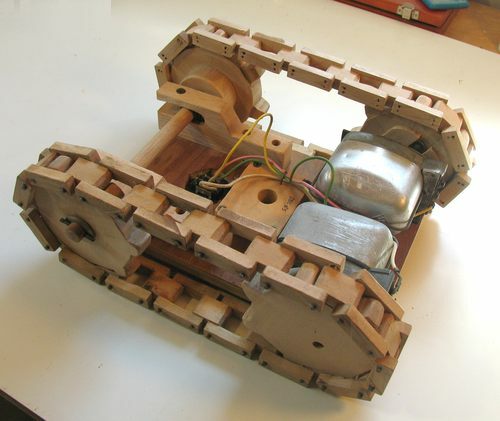 This little tank thread vehicle I built more or less as an experiment back in 1985. 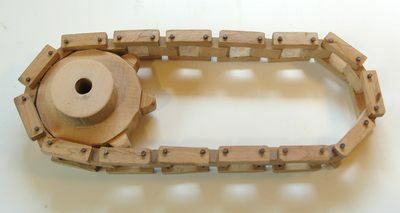 I had been experimenting with wooden chains, and so decided to try a block chain made out of maple as a tank thread. Both the track and the sprockets are made out of maple. The track's 'pins' are actually just a bunch of nails. The center blocks of chains have a holes slightly larger than the nails, while the outside tie pieces have holes slightly smaller than the nail, so that the nail is held in by friction. Once the nail is driven through the blocks, the sharp ends of the nails are cut off. Its really quite a simple process, although it does get a bit tedious to make for longer chains. The surprising thing about a chain like that is its toughness. When I built this thing, I didn't expect the chain to last, but I have had quite a lot of fun playing around with this thing, and so far have not had the chain fail. The key I think is to use a heavy close grained wood like maple to make it strong. Propulsion for this vehicle is a pair of VW beetle windshield wiper motors. These are parts from original VW beetles, which I pulled out of wrecked cars at the dump. 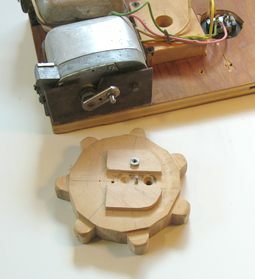 The drive sprockets are shaped to fit onto the crank, held on with just one screw. These exact motors are probably impossible to get nowadays, so if you want to build something like this, you will have to find some other source of gear head motors. I'm sure there are some models of wiper motors that could also be used. The idler pulleys for the other end of the chain simply run on a wooden shaft. I greased it a little bit, although that wasn't really necessary. 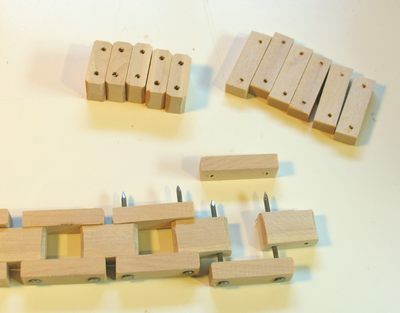 Note the springs in the blocks, which allow for a bit of give but keep the chain taut. And here's the underside of the assembled vehicle. 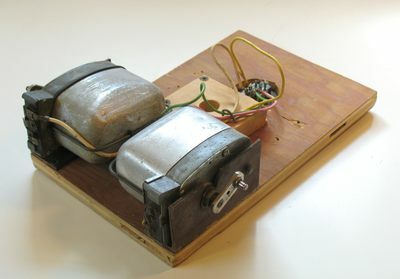 The motors are simply wired to a connector. There's no battery or remote control electronics. I didn't care to mess with that sort of thing, and being a high school student in Northern Ontario back in 1985, I certainly didn't have access to that sort of electronics, or even the money for wireless remote control. 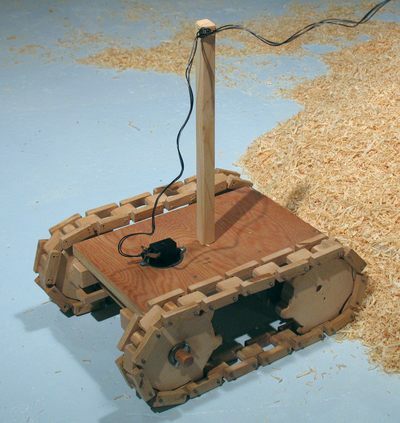 Instead of a remote control, the vehicle is tethered to a three conductor wire. I run it off a center tapped power supply. 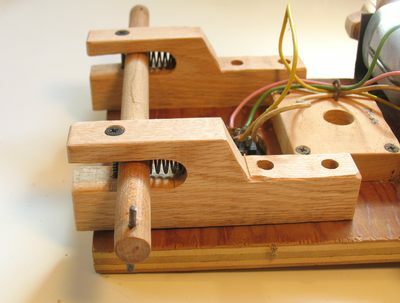 The ground of both motors connects to the center tap, and to move it in either direction, the motor's other terminal is connected to the +12 or -12 volts taps on the power supply. I didn't have a switch handy that would work well for this application, so just rigged something up very simple. 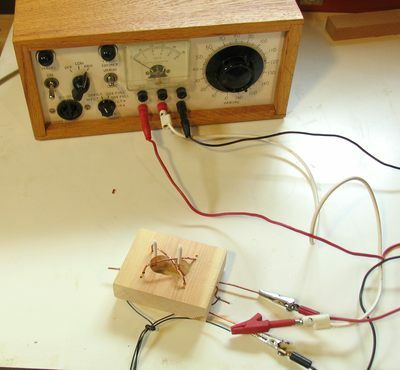 The crossing copper wires on the block are the +12 and -12 volts. 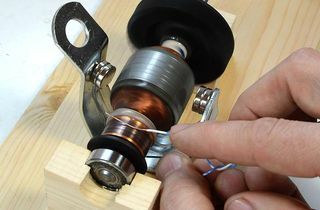 Because one motor needs to run in reverse and one forward to drive in a straight line, that means one motor connects to +12 and the other to -12 volts when both sticks are pushed in the same direction. Hence the +12 and -12 volts rails need to cross. Or the controls would be somewhat counter intuitive. Having the controls work this way is good, because it means for straight line moves, the motors are for the most part running in series off 24 volts. As such, the resistance of the long and thin wire plays less of a part. The motors slow down noticeably when one is put in forward and the other in reverse, because in that arrangement, they are on 12 volts in parallel, with current for both having to go through the common conductor, so voltage drop from resistance is a much bigger factor. Getting the wire caught in the tracks is a constant hazzard. A small mast on top helps keep it clear of the tracks most of the time. 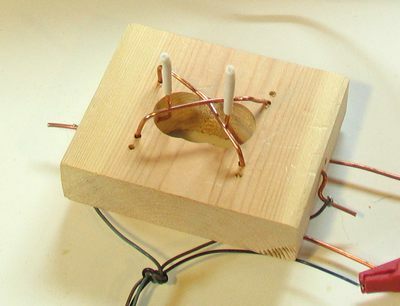 It also helps to attach the other end of the wire to something high. Otherwise, on backing up, one is likely to get entangled with the wire. The tether wire is not overly elegant, but - well - it just works, and it doesn't add to the weight of the vehicle. So really, I think its a pretty good solution. And here's another video of it, just because its so much fun. 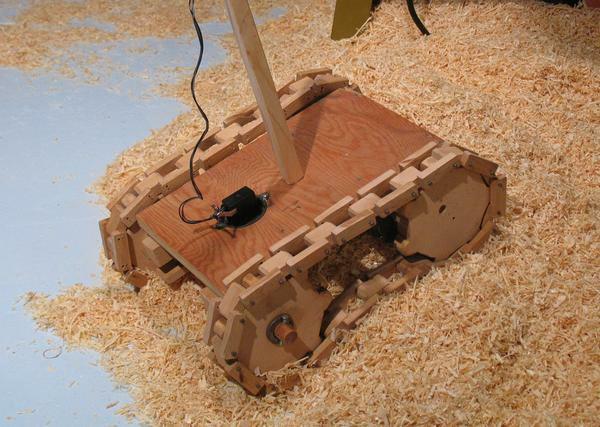 This one is of the vehicle driving around a pile of planer shavings. This works surprisingly well, although the shavings do cause the tracks to come off once in a while.